For LDM Readers: Melody is now putting Keith Green Film Prayer Updates in her monthly e-newsletter with her articles. Just register (on the front page) to receive her e-newsletters. You'll be blessed! In response to your requests I want to let you know how to keep praying. Making a movie reminds me of a train trip I took in Europe between countries. Steadily moving forward the landscape and lighting changed. And as soon as some reached the end of their trip others jumped on board and sat by me to start theirs. Like train tracks the script nails down the route and considers the best parts to see along the way. The most relevant parts of Keith’s journey unfold during the long and crucial process of script development. We also want to add to the team. It takes a village so a few more need to jump on board. Please ask the Lord to call the right people forth, and for continued creativity, wisdom, and anointing. I feel such urgency and passion in my heart. I know Keith’s story will challenge a whole new generation to go deeper. It will bring hope and inspire many to embrace Jesus. Your prayers are vital. They have already made a difference and are essential to bring Keith’s story to the screen. I covet your prayers as well. Pastor Bob Maddux leads in prayer with Melody (R) and others. 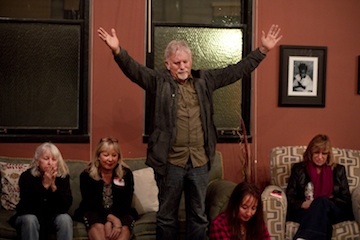 A few weeks ago in California about 40 prayer leaders gathered with Melody, LDM staff, and the film producers to pray for the movie. Melody prayed specifically for the screenplay being written from her book, "Without Your anointing God, it will be just "another movie" -- without power to change lives." Please join us in prayer for the script which is now being written. We are certain the Lord wants to use this film powerfully. Hey everyone I am so excited!! A feature film of Keith’s life is in development! What is most needed RIGHT NOW is PRAYER. Shortly after the plane crash, I knew someday there would be a movie about Keith. I’ve waited for over 25 years for the Lord’s timing -- for God to bring producers with the right hearts, the vision and expertise to take Keith’s story to the big screen. I always had a specific vision for the movie… just as I did when I wrote Keith’s story in No Compromise. I want people to join Keith in his searching years and then track with us together on our journey to faith. It must be authentic -- and connect to both the heart and the spirit. The Screenplay is being written right now – so please pray for it specifically! For the story line, the events shown, and the power of God to be woven into it. Every film that is taken from a book is much more condensed than the book, so everyone involved needs great and specific guidance. I know Keith’s story will be used in powerful ways to touch lives. I want it to accurately represent his life and ministry. Obviously there will be lots of great music too! I just returned from our original LDM property in Texas, where I ministered at Teen Mania Ministries. One of the producers came for research and to film me sharing my memories at certain sites. It was an intensely emotional time for me, bringing back many memories. One moment I was laughing, the next, I was crying. The two photos below show me in front of the farmhouse where Keith and I lived with our little children, as well as a photo of the headstone for Keith, Josiah, and Bethany. This movie is a God-sized job that needs to be bathed in prayer… for wisdom, anointing, divine connections, favor in the industry, the funding that is needed, and much more. Prayer is essential! When Keith recorded each of his albums, we had constant prayer in the studio, and at LDM. We also had intercessors praying during his concerts. Along with everyone at LDM I'm serving to rally prayer and intercession. We want to see more than just a "good movie" -- we all want it to have a powerful anointing so lives around the world will be touched and transformed! Please forward this to your friends and ask them to pray with us. If they register at our website we’ll keep them posted as we go. Eventually we're hoping you’ll be able to sign up for prayer time slots during casting, production and post production. For now please pray for the Screenplay! It will become the footprint for the film. with FREE life-changing messages and discipleship materials. Please do not hit reply to this email as it will go to an unmonitored box. If you want to contact LDM regarding this email, visit the website, and use the Contact Us section under LDM section. Thank you!